John Wilson married Janet Napier who is the mother of John Napier who was an ardent student of Revelations. Janet is the granddaughter of King Robert. She had three children with King James. This may explain why John and William Wilson were born at Windsor, and were heads of the Church, interred at Saint George’s Cathedral. The King and Queens of Scotland are in my Rosy Tree! The only reason Janet and her kindred, would want John Wilson in their/her family tree, is his mother was Princess Ada Antoinette Erasmus, related to the Schwarzenberg- Sienshiem Nobility of Bohemia-Czechoslovakia. I may be in line for the King of Scotland – and Bohemia! I am the ‘Hidden Seed’. I see a Union between the United States, Scotland, and the Czech Republic. Now I know why managers of the Wilson-Erasmus Tree have been doing some serious pruning. However, here is a Stewart genealogy which has kept the ‘Hidden Seed’ alive! Victoria Bond has led me to these Johns, and Merchiston Tower where we will look at the coming of The End of Days! I have a Guardian and Guiding Angel who is a female. John Ramsay, 1st Lord Bothwell (c. 1464 – 9 September 1513), also known as Sir John Ramsay of Trarinzeane, was a Scottish peer and courtier. He was the son of John Ramsay of Corstoun in Fife (kin to the Ramsays of Carnock otherwise Pitcruvie) and Janet Napier presumed to be of the Merchiston Napiers. Janet Napier later married John Wilson a Burgess of Edinburgh (Parliamentary records of 1484). The publication Royal Stewart Family Tree has been compiled by Amanda Yvonne Annie Bella (contact author). The data collection consists of 3,450 persons, data about 40 individuals have not been published to protect their privacy. More statistical information about the publication (like numbers and dispersion of genealogical events) can be found on the statistics page. A list with used sources can be found on the sources page. Janet came from Scottish nobility: through her father, she was a great-great-granddaughter of King Robert III wheres her mother was the daughter of Alexander Gordon, 1st Earl of Huntly. She is believed to have first been married to Alexander Gordon circa 1493. They may have had a daughter. By 1497, Janet was the mistress of Archibald Douglas, 5th Earl of Angus (“Bell the Cat”), with whom she had a daughter, Mary. They also may have been married, though she was never described as his Countess. She attracted the attention of King James IV around 1497. She had three children with the king. They included James Stewart, 1st Earl of Moray, Margaret and Jane Stewart. The King had a number of mistresses, but this appears to have been his longest relationship, which continued even after his marriage to Margaret Tudor. After James IV’s marriage by proxy, he met Janet at Bothwell Castle in April 1503, then she was sent to Darnaway Castle in August just before Margaret arrived. It is not clear whether she is the same as the “Janet bair ars” who received gifts from the king in 1505–12. She also had relationships with two other men, one of whom was John Ramsay, 1st Lord Bothwell whom she married in 1505. Two of her partners died at the Battle of Flodden. John Napier was born in 1550, at birth place, to Archibald Napier and Janet Napier (born Bothwell). Archibald was born in 1534, in Merchiston, Midlothian, Scotland. Janet was born circa 1530, in Stirling, Stirlingshire, Scotland. John had 11 siblings: Francis Napier, Anna (Janet) Napier and 9 other siblings. John married Elizabeth Napier (born Stirling) on month day 1572, at age 22. Elizabeth was born circa 1554, in Keir, Lecrpot, Dumfries, Scotland. They had 2 children: Archibald Napier and one other child. John married Agnes Napier (born Chisholm) on month day 1563, at age 13 at marriage place. Agnes was born in 1560, in Cromlix, Perthshire, Scotland. John Napier is best known as the discoverer of logarithms. He also invented the so-called “Napier’s bones” and made common the use of the decimal point in arithmetic and mathematics. Napier’s birthplace, Merchiston Tower in Edinburgh, is now part of the facilities of Edinburgh Napier University. Napier died from the effects of gout at home at Merchiston Castle and his remains were buried in the kirkyard of St Giles. Following the loss of the kirkyard there to build Parliament House, he was memorialised at St Cuthbert’s at the west side of Edinburgh. 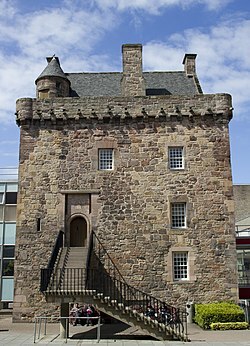 Merchiston Tower, also known as Merchiston Castle, was probably built by Alexander Napier, the second Laird of Merchiston around 1454. It serves as the seat for Clan Napier. It was the home of John Napier, the 8th Laird of Merchiston and the inventor of logarithms, who was born there in 1550. The tower stands at the centre of Edinburgh Napier University‘s Merchiston campus. Merchiston Tower as it appeared in 1829, showing the addition to the front made by the Merchiston Castle School, which occupied it at that time. The lands surrounding the castle were acquired in 1438 by Alexander Napier, the first Laird of Merchiston, and remained in the Napier family for most of the following five centuries. Merchiston Castle was probably built as a country house, but its strategic position and the turbulent political situation required it to be heavily fortified – with some walls as much as six feet thick – and it was frequently under siege. During restoration in the 1960s, a 26-pound cannonball was found embedded in the Tower, thought to date from the struggle in 1572 between Mary, Queen of Scots, and supporters of her son, James VI. In 1659, the castle was sold to Ninian Lowis, in whose family it remained until 1729, when it was sold to the governors of George Watson’s Hospital (the Merchant Company of Edinburgh). The tower was reacquired by the Napier of Merchiston family when Francis Napier, 6th Lord Napier bought it in 1752. In 1772, a year before the sixth Lord’s death, the Tower was sold to a relative, Charles Hope-Weir, second son of John Hope, 2nd Earl of Hopetoun. Weir sold it in 1775 to Robert Turner, a lawyer, who sold it in 1785 to Robert Blair, a professor of astronomy at Edinburgh University. The Napier family again came into possession of Merchiston Castle in 1818, when it was purchased by William Napier, 9th Lord Napier. In 1833, Lord Napier let the Tower to Charles Chalmers, who founded the Merchiston Castle School. It was sold outright to the school in 1914 by The Honourable John Scott Napier, fourteenth Laird of Merchiston (son of Francis Napier, 10th Lord Napier). The school vacated the building in 1930, moving to a site some three miles away. In 1930 the property returned to the ownership of The Merchant Company, who used nearby playing fields for George Watson’s College, which was soon itself to move nearby. Then in 1935 the tower passed to Edinburgh City Council. It remained unoccupied (except for war service) until 1956, when it was suggested as the centrepiece of a new technical college. Restoration work began in 1958, highlights of which were the discovery of the entrance drawbridge and the preservation of a seventeenth-century plaster ceiling. It now stands at the centre of Napier University’s Merchiston campus. Images of Merchiston Tower as it appeared in 1883, after renovations done by the Merchiston Castle School. The Tower is an interesting and elaborate example of the medieval tower house, being built on the familiar “L” plan with a wing projecting to the north. It was originally vaulted at the second floor and the roof. Among several remarkable features is the unusual elaboration of the main entrance, which is at second floor level in the south front. The tall shallow recess in which the doorway is set undoubtedly housed a drawbridge which must have rested upon an outwork some 14 feet above ground level and 10 feet from the Tower. Shortly after being let to Merchiston Castle School it was considerably altered with the addition of a castellated Gothic-style two-story extension (see picture) and a basement, which has since been removed. Napier University has taken out large sections of wall on the northern extension to accommodate a corridor which runs through the Castle to other campus buildings. Napier’s father was Sir Archibald Napier of Merchiston Castle, and his mother was Janet Bothwell, daughter of the politician and judge Francis Bothwell, Lord of Session, and a sister of Adam Bothwell who became the Bishop of Orkney. Archibald Napier was 16 years old when John Napier was born. As was the common practice for members of the nobility at that time, he was privately tutored and did not have formal education until he was 13, when he was sent to St Salvator’s College, St Andrews. He did not stay in college very long. It is believed that he dropped out of school in Scotland and perhaps travelled in mainland Europe to better continue his studies. Little is known about those years, where, when, or with whom he might have studied, although his uncle Adam Bothwell wrote a letter to John’s father on 5 December 1560, saying “I pray you, sir, to send John to the schools either to France or Flanders, for he can learn no good at home”, and it is believed that this advice was followed. Many mathematicians at the time were acutely aware of the issues of computation and were dedicated to relieving practitioners of the calculation burden. In particular, the Scottish mathematician John Napier was famous for his devices to assist with computation. He invented a well-known mathematical artifact, the ingenious numbering rods more quaintly known as “Napier’s bones,” that offered mechanical means for facilitating computation. 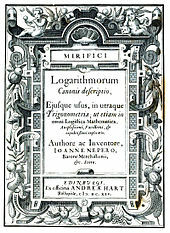 His work, Mirifici Logarithmorum Canonis Descriptio (1614) contained fifty-seven pages of explanatory matter and ninety pages of tables of numbers related to natural logarithms (see Napierian logarithm). The book also has an excellent discussion of theorems in spherical trigonometry, usually known as Napier’s Rules of Circular Parts. See also Pentagramma mirificum. Modern English translations of both Napier’s books on logarithms and their description can be found on the web, as well as a discussion of Napier’s Bones (see below) and Promptuary (another early calculating device). His invention of logarithms was quickly taken up at Gresham College, and prominent English mathematician Henry Briggs visited Napier in 1615. Among the matters they discussed were a re-scaling of Napier’s logarithms, in which the presence of the mathematical constant now known as e (more accurately, e times a large power of 10 rounded to an integer) was a practical difficulty. Neither Napier nor Briggs actually discovered the constant e; that discovery was made decades later by Jacob Bernoulli. Napier made further contributions. He improved Simon Stevin‘s decimal notation. Lattice multiplication, used by Fibonacci, was made more convenient by his introduction of Napier’s bones, a multiplication tool using a set of numbered rods. Napier had an interest in the Book of Revelation, from his student days at St Salvator’s College, St Andrews. Under the influence of the sermons of Christopher Goodman, he developed a strongly anti-papal reading. He further used the Book of Revelation for chronography, to predict the Apocalypse, in A Plaine Discovery of the Whole Revelation of St. John (1593), which he regarded as his most important work; he also applied the Sibylline Oracles, to calculate the date of the end of the world. Napier believed that would occur in 1688 or 1700. He dated the seventh trumpet to 1541. In his dedication of the Plaine Discovery to James VI, dated 29 Jan 1594, Napier urged the king to see “that justice be done against the enemies of God’s church,” and counselled the King “to reform the universal enormities of his country, and first to begin at his own house, family, and court.” The volume includes nine pages of Napier’s English verse. It met with success at home and abroad. In 1600 Michiel Panneel produced a Dutch translation, and this reached a second edition in 1607. In 1602 the work appeared at La Rochelle in a French version, by Georges Thomson, revised by Napier, and that also went through several editions (1603, 1605, and 1607). A new edition of the English original was called for in 1611, when it was revised and corrected by the author, and enlarged by the addition of With a resolution of certain doubts, moved by some well affected brethren. ; this appeared simultaneously at Edinburgh and London. The author stated that he still intended to publish a Latin edition, but it never appeared. 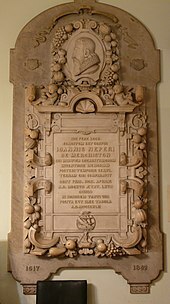 A German translation, by Leo de Dromna, of the first part of Napier’s work appeared at Gera in 1611, and of the whole by Wolfgang Meyer at Frankfurt-am-Main, in 1615. Among Napier’s followers was Matthew Cotterius (Matthieu Cottière). Among Napier’s early followers were the instrument makers Edmund Gunter and John Speidell. The development of logarithms is given credit as the largest single factor in the general adoption of decimal arithmetic. The Trissotetras (1645) of Thomas Urquhart builds on Napier’s work, in trigonometry. In 1572, Napier married 16-year-old Elizabeth, daughter of James Stirling, the 4th Laird of Keir and of Cadder. They had two children. Elizabeth died in 1579, and Napier then married Agnes Chisholm, with whom he had ten more children. His father-in-law James Chisholm of Cromlix was later mixed up in the Spanish blanks plot, over which Napier with others petitioned the king. They had 10 children: Robert Mungo Napier, John Napier and 8 other children. His occupations were occupation and occupation. John passed away on month day 1617, at age 67 at death place. He was buried at burial place.